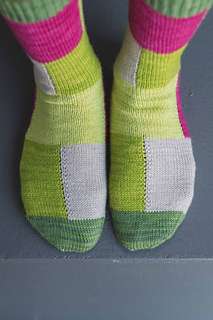 The bold Cube Socks look different from every angle, with color-changing boxes made using the intarsia method. The tutorial in the pattern lets you confidently try out intarsia in the round for this manageable project. Finished Size 6.75 (7.75, 8.75)“ foot circumference and 9 (9.5, 10)” long from back of heel to tip of toe; foot length is adjustable. Socks shown measure 7.75”. Yarn SweetGeorgia Yarns Tough Love Sock Party of Five Mini-Skein Set (80% superwash merino wool, 20% nylon; 525 yd / 5 oz; 105 yd / skein): snapdragon (A: lettuce wrap—dark green;B: orchid—pink: B; C: melon—light green; pistachio—medium green; E: birch—ecru), 1 set of 5 skeins. Needles Size 1.5 (2.5 mm). Adjust needle size if necessary to obtain the correct gauge. Gauge 33 sts and 44 rnds = 4” in St st.
Notes These socks are worked from the cuff down with a heel flap.